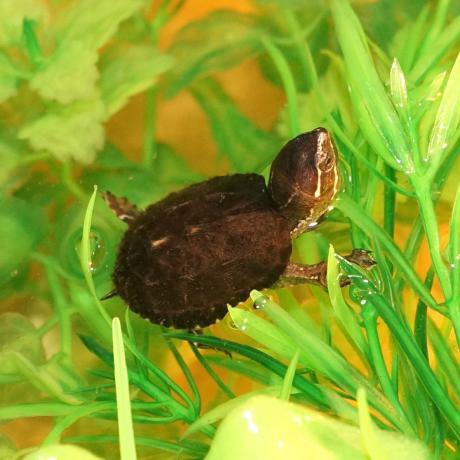 The Common Musk Turtle is an ideal beginner species due to their adult size and ease of care. They are also known as Stinkpot Turtles due to a smelly liquid they produce from musk glands when threatened. What does the Common Musk Turtle look like? The Common Musk Turtle is a small species reaching an adult length of 7.5-12.5cm (3-5 inch). Males can be determined by the longer tail and overall larger size. Their shell colouration can be black, grey or brown. They have a pair of yellow or green strip running from the tip of their nose to the neck. The jaw is powerful and can easily crush hard snail shells. As the name suggests, these turtle can emit a smelly liquid from its musk glands when threatened by predators; they rarely do this in captivity. They are also known as Stinkpot Turtles due to the musk they emit. Where is the Common Musk Turtle from? The Common Musk Turtles range is from south eastern Canada down through the south eastern and south central American. They are mainly an aquatic turtle found living in shallow slow moving streams, ponds, rarely found basking. 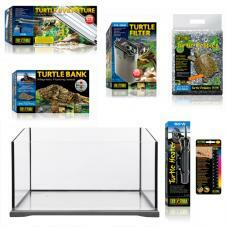 How do you keep Common Musk Turtles? 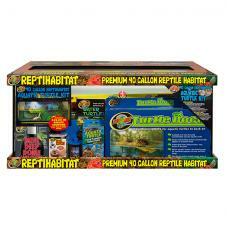 Due to their small size an adult can be kept in a minimum 24" aquarium (20 gallon), a pair or trio in a 36" (30 gallon). Babies should be kept in a smaller aquarium and moved as they grow. Due to them being a ground walker rather than swimmer, provide a shallow water depth of 10-15cm (4-5 inches); increase this depth as they grow. Common Musk Turtles are classed as nearly entirely aquatic, they will venture onto land to bask occasionally and therefore a small rock protruding from the water should be efficient. A basking temperature of 28-32C (82-90F) should be provided with an air temperature of 24-28C (75-82F). We use a basking bulb and the compact 5% UVB above all our turtle enclosures, you can also use the Exo Terra Turtle UVB Fixture. Water temperatures for babies should be maintained around 23-26C (74-79F), adults can be kept at lower temperatures of 20-23C (68-73F). 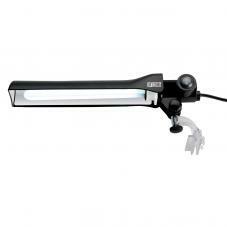 These temperatures can easily be maintained with a submersible aquarium heater such as the Exo Terra Turtle Heater. 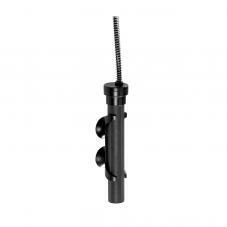 The use of a filter is required to keep the water clean as they are quite messy feeders, use one with a low water flow or one that can be adjusted. 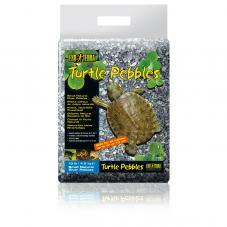 The use of a fine aquarium sand or smooth pebbles will help your turtle to walk along the bottom. Place bogwood, rocks, ceramic plant pots and other objects in the tank for your Common Musk Turtle to investigate and hide beneath. They prefer plenty of vegetation, the use of artificial plant or live can be use; latter will require UVB lighting for growth. 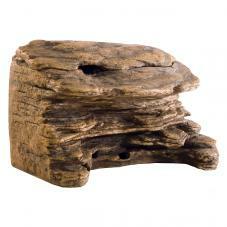 Water changes should be carried out frequently as you would with fish keeping. A 25% water change every two weeks will be efficient; treat new water with a de-chlorinate treatment. Importantly, after handling or when maintaining the aquarium water/decor, you must always wash your hand thoroughly to prevent any disease being spread such as salmonella.